Today’s teens are the ones who are in line to take over business, the world. They’re the first generation to not know life before the Internet, the Web, apps, smartphones, constantly being connected and being able to tap into any news, information, entertainment anywhere in the world. Gen Z is rapidly coming into its own in terms of influence, consumption and spending power so the more you understand them, the better chance you have to be the product/service they want to adopt, support, use and recommend. Wiki’s co-founder, Jimmy Wales noted, "It is clear that this generation is using technology in a way that is smarter, more involved and beneficial to their future. We can learn a lot from how this unbounded, younger generation interacts with technology and are able to quickly adapt to this rapidly changing media landscape." Compared to the generation before them, Gen Zers appear to have a good grasp of the world they’re going to inherit. Perhaps it is because Internet access has made it easy for them to judge “facts” for themselves. Financial Focus – Today’s teens are already looking to the future with over half (62 percent) putting almost half of their earnings into savings. That may not sound like much but it represents more than $44B annually. They are certain they’ll fail at least once in their lives but feel it will be a learning experience. In addition they plan to someday have a home and car. Parents of teens and Millennials got involved with the Internet when content was mostly text; but for teens, it is just one giant TV/new/information/radio channel they can tap into with any device that’s at hand – when they want, where they want, how they want. Since they were almost literally born connected the Internet, Gen Zers’ Internet use is high, regardless of the device. But as a clear indication of what tomorrow holds for device, app producers and online/onsite retailers, a growing volume of their access is being done with mobile devices. Born Connected – Following the Millennial generation, Gen Zers (1995 – 2009) started their journey when the Internet was already established. As a result, they’ve been the first generation to know everything – documents, data, images and entertainment – is online. Accustomed to using whatever device is at hand, they will be the most studied, analyzed and tracked generation … until the next generation comes along. According to Pew Research, males tended to use the Internet more than females, and rural teens were more likely to access the iNet than urban teens (99% vs. 94%). 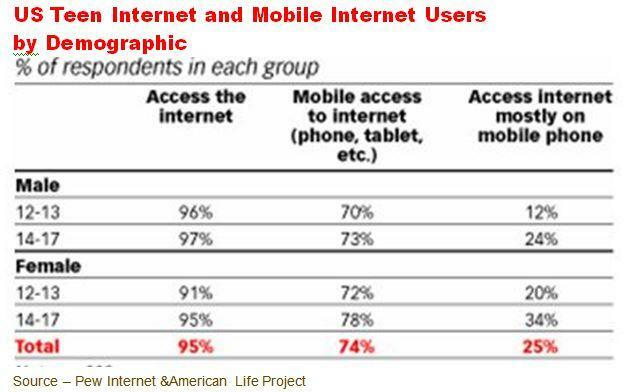 However, females were slightly more likely to use mobile access than males (25% vs. 20%). 78 percent of teens have a cell phone, almost half (47%) smartphones. Being online almost every waking moment, teens are sharing more information about themselves on social media sites than in the past. However they are also taking more aggressive steps to manage their privacy and are concerned about third-parties (businesses, advertisers) accessing their information. A study by Camp Mobile found that 81 percent of teens felt their peers shared too much information. 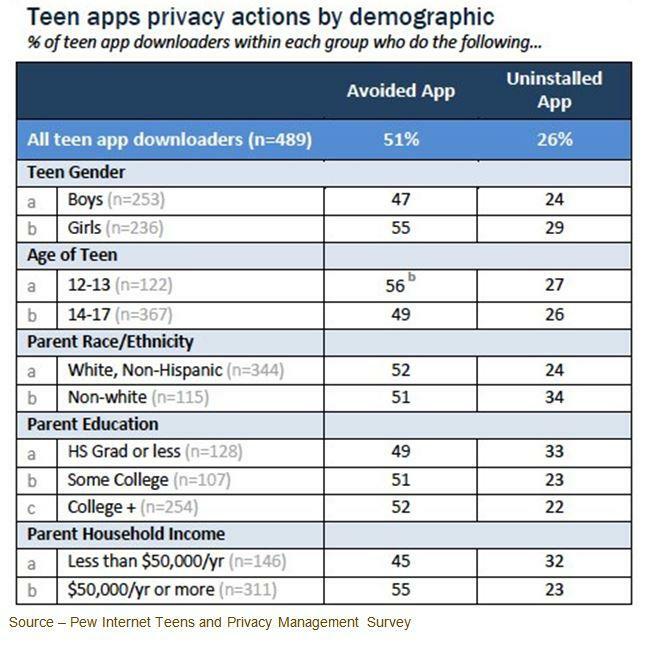 Teens have embraced app downloading in a major way (especially games) however, a growing number uninstall or avoid apps because of security/privacy concerns. Free, But – Today’s teens’ first choice – like everyone – is a free app. However, if the app wants too much personal information or can track them they will not download it and if it’s already on their device, they’ll uninstall it. 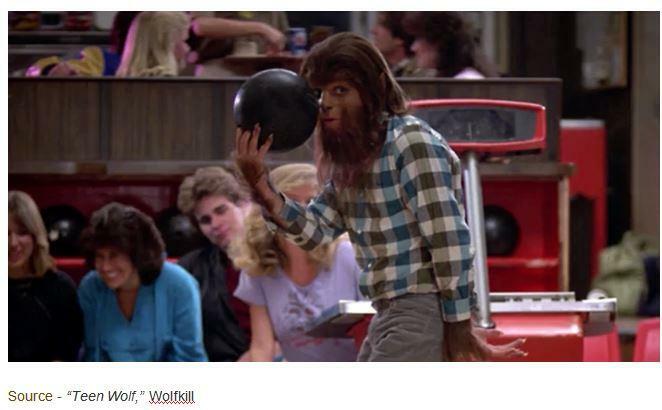 They’re just as careful with their online social media persona and monitor it more closely than older generations. Girls have become especially sensitive to location information monitoring and have disabled the features on their smartphones and apps. eMarketer estimates 97 percent of Gen Zers will use the Internet this year and that regular social media activity will increase to 86.5 percent. A growing number will keep a closer eye on how much they reveal to the world, including selfies. Unlike Millennials, Gen Zers prefer hangouts like Snapchat and Whisper to Facebook and Twitter. They’re very visually oriented and, having been immersed in it since the beginning, are very tech-savvy. They’ve grown up in the DIY (do-it-yourself) environment, focus on how things are made, seek peer recommendations/affirmation and are usually early adopters of products that are practical yet cool.